Knob Light Door Handle Makes Sense | OhGizmo! It’s just another concept at this point, but Jeong-Sun Park’s Knob Light will be appreciated by anyone who tends to wander the house at night. 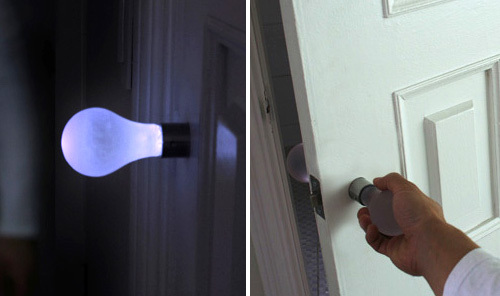 It’s basically a replacement door knob in the shape of a glowing light bulb, making it easier to find your way around when the lights are all off. There’s no specifics on how the bulb is supposed to get power, since doors aren’t usually wired for electricity, but I’m pretty sure it will use LED based bulbs instead of incandescent ones because of the whole hot glass vs. skin issue. I have one of these hanging from my ceiling at home. I grabbed it once and to my surprise my skin stuck to it in hot melty strings. It was quite a time indeed.